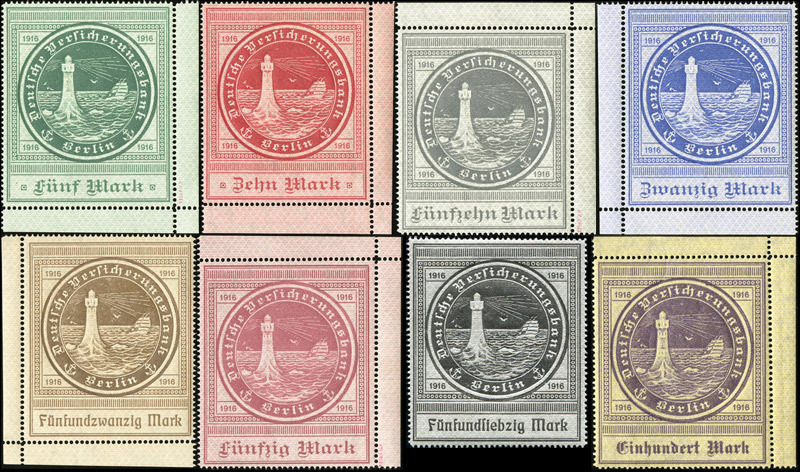 One of my favorites -- the stamps of the Deutsch Ozean-reederei and the Tauchbootbriefe. By 1916, the German war effort was suffering under the weight of the Entente naval blockade, which had been in force since shortly after the outbreak of the war. 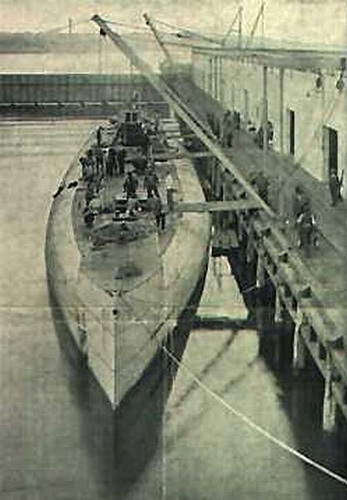 Having been unsuccessful in its attempts to break the blockade, Germany decide to construct a class of unarmed cargo U-boats to serve as blockade runners. 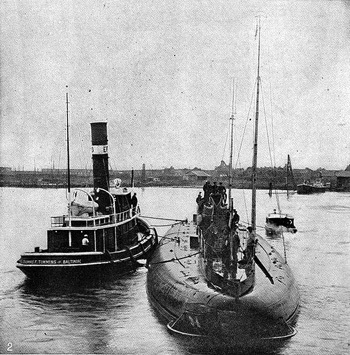 This class, the U-151 class, was originally to consist of seven boats, but only two, Deutschland and Bremen, were completed in accordance with the original specs. The remaining five were completed as heavily armed long-range U-boats. The Deutschland and Bremen were built by the Deutsche Ozean-Reederei (German Ocean Shipping Company), a subsidiary of the Norddeutscher Lloyd (North German Lloyd) shipping company and the Deutsche Bank, which was created explicitly for this enterprise. The Deutschland made two voyages to the U.S. In the summer of 1916, she delivered a cargo of chemical dyes, medical drugs, gems, and mail to Baltimore, Maryland, then returned to Bremerhaven with a cargo of nickel, tin, and crude rubber. In the fall of 1916, she delivered a cargo of gems, securities, and medicinal products to New London, Connecticut, and returned with a cargo of silver bullion. Before the Deutschland could embark on a third voyage, relations between Germany and the U.S. deteriorated significantly, so she was converted to an armed U-boat, the U-155. 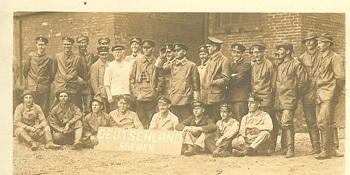 The Bremen departed Bremerhaven in September 1916 for Norfolk, Virginia. She reportedly carried funds which were to be used to pay an American firm to build more cargo submarines for Germany. She never arrived in Virginia, and her fate remains unknown. 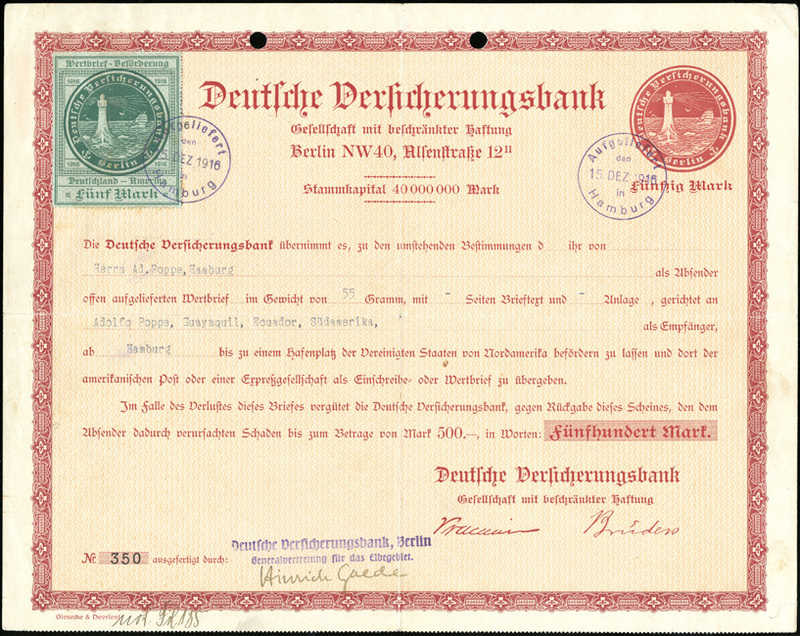 On the Deutschland's first two voyages, the only items accepted for transportation were insured packages (another option was added for the aborted third voyage, but we'll get to that...). 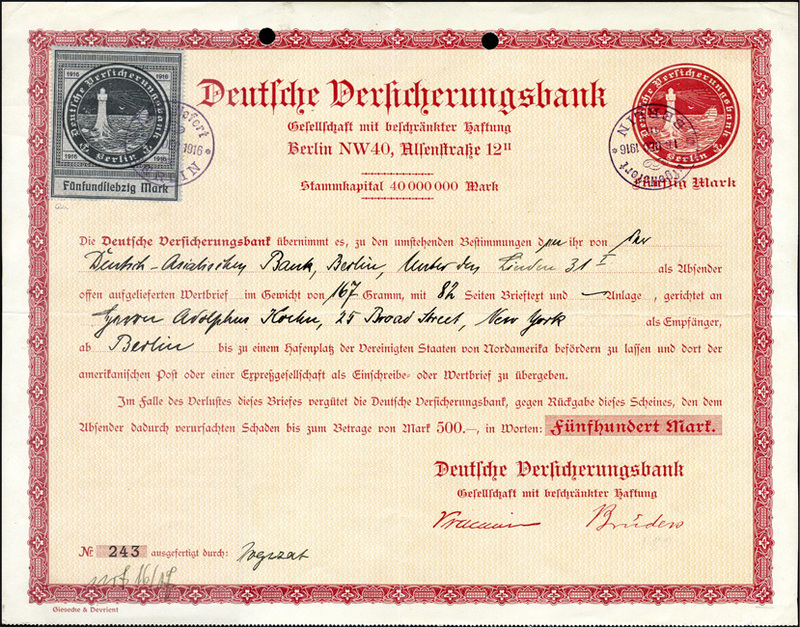 The process for shipping an item was that first, the mail had to be brought to the Insurance Bank offices in either Berlin, Hamburg, or Bremen. 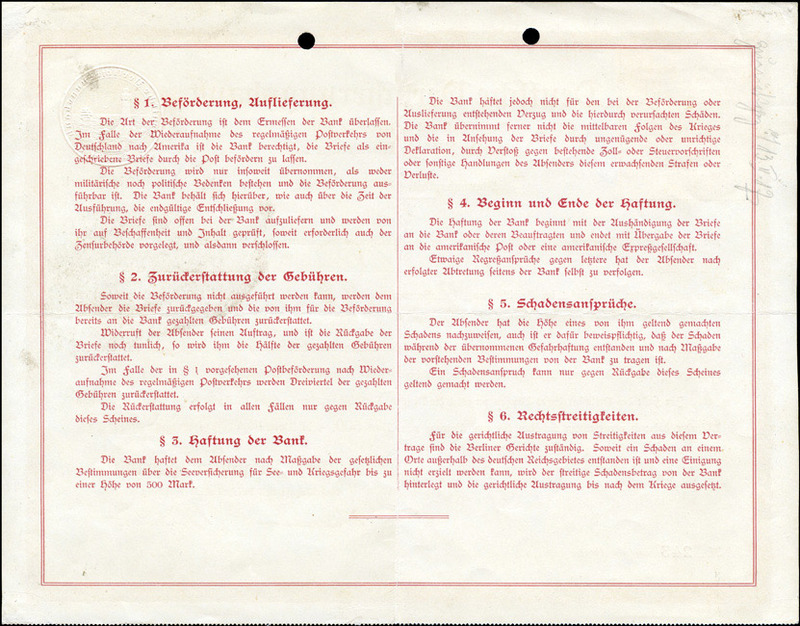 The Insurance Bank would issue an insurance certificate which bore an imprint of the 50 Mark design, and which was valid for mailings up to the 50 Mark rate (up to 50 grams). The certificates had three detachable coupons at the bottom -- one for the insurance bank, one for the agency bank, and one for the sender -- but these are rare on surviving certificates as they were detached upon issue. If the mail or package required more than 50 Marks postage and insurance, an insurance stamp was attached to the certificate to cover the difference. 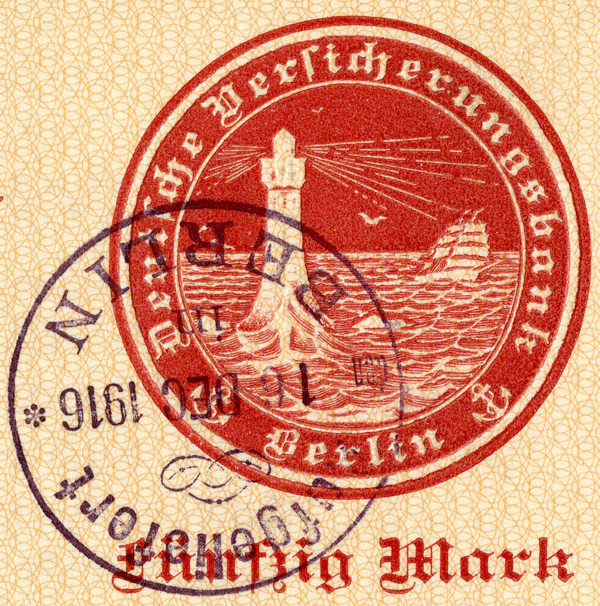 The first series of insurance stamps features the inscription "Deutsche Versicherungsbank Berlin / Wertbrief-Beförderung / Deutschland-Amerika 1916" (German Insurance Bank Berlin / Insured Letter Carrier / Germany-America 1916). The second series of insurance stamps differs slightly from the first in that the stamps don't have the inscription "Wertbrief-Beförderung / Deutschland-Amerika 1916" (Insured Letter Carrier / Germany-America 1916). They also feature a watermark of oblique wavy lines. 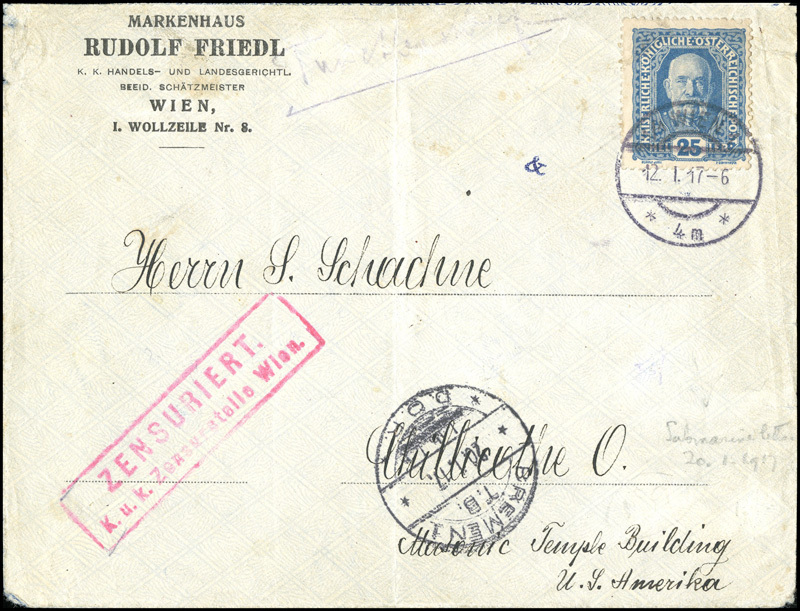 For example, this certificate from the cancelled third voyage was for a shipment to Ecuador weighing 55 grams, requiring the addition of a 5 Mark Ozean-reederei stamp to cover the extra 5 grams. And this certificate, also from the cancelled third voyage, shows the addition of 75 Marks to cover the 150-200 gram rate (the package was 167 grams). 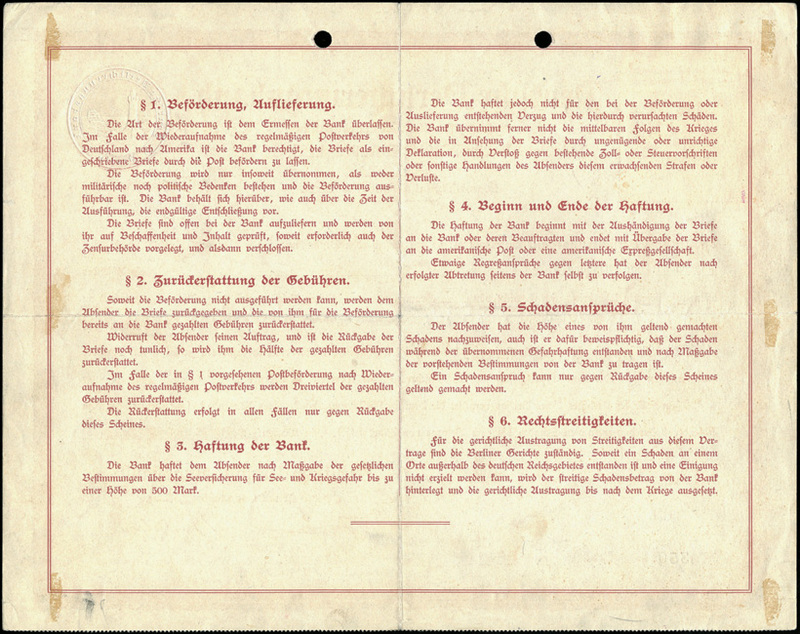 As stated above, on the first two voyages of the Deutschland, no mail was officially transported on the German-to-America leg other than by the above described procedure. 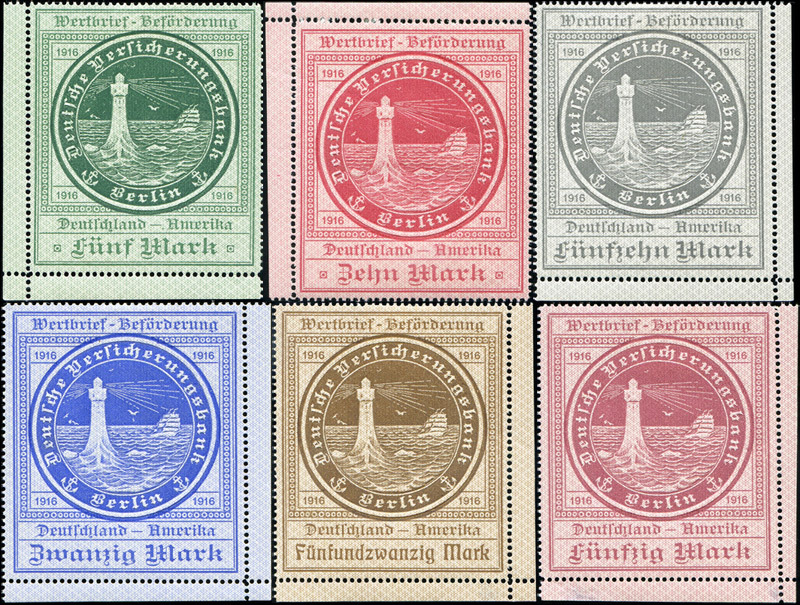 For the cancelled third voyage, however, the German postal authorities offered to carry regular mail (as opposed to high-value mail requiring insurance) originating from within any of the Central Powers. To send mail by this manner was a complicated process. 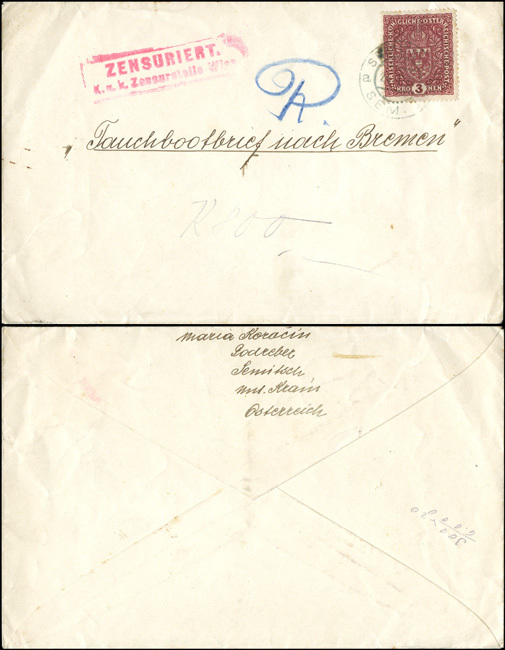 The sender had to attach the proper postage for normal foreign post and have it cancelled at the post office of origin, then place the entire letter, unsealed, in an outer envelope bearing only the words "Tauchbootbrief nach Bremen" (submarine letter to Bremen). The outer envelope was then franked to cover the cost of the service. 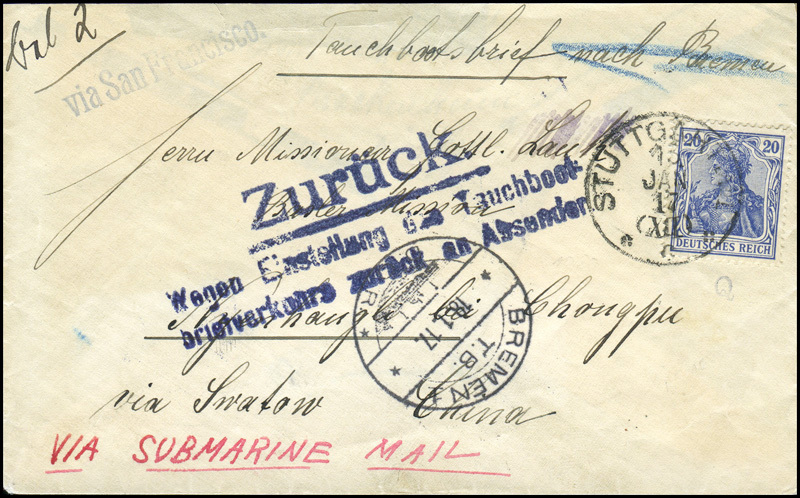 In Bremen, the inner envelope was removed from the outer envelope and marked with a dated submarine cachet. The T.B. stands for Tauchboot, and the DOR for Deutsch Ozean-Reederei. The mail was also censored in the process. 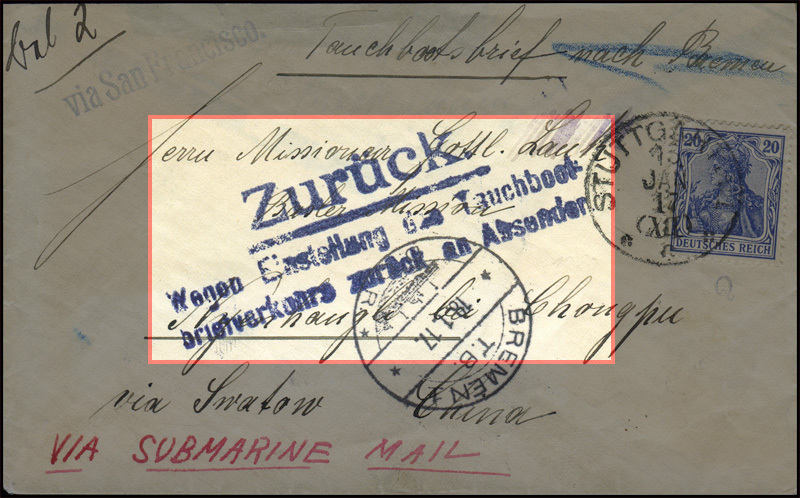 For mail originating in Austria, a common censor mark was the red rectangle bearing the phrase "Zensuriert K.u.k. Zensurstelle" (Censored K.u.k. censorship office) and the city. 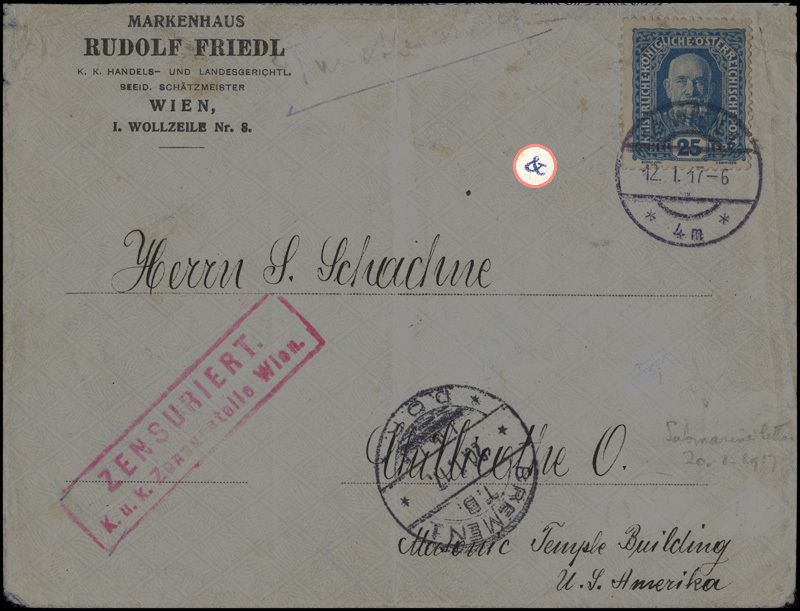 Germany also censored the mail, but in an effort to keep the U.S. from realizing this, the censor marks are small and unobtrusive. Thirteen varieties are known. Here's another Tauchbootbriefe from the cancelled third voyage. This one is unusual in that it's addressed to the German mission station in Nyenhangli, China via Swatow, China. 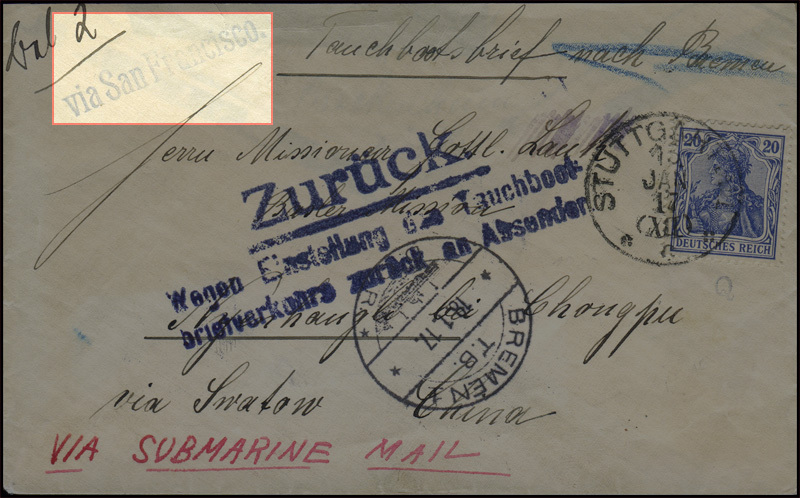 The German authorities would mark many of the letters with a cachet stating "Zurück / Wegen Einstellung des Tauchbootbriefverkehrs zurück an Absender" (Return / Because of termination of the submarine mail service return to sender). This letter also bears a "Via San Francisco" directional cachet applied at Bremen to any trans-Pacific mail.